The populations of Earth’s wild mammals, birds, amphibians, fish and other vertebrates declined by more than half between 1970 and 2012, according to a report from environmental charity WWF and the Zoological Society of London (ZSL). Activities such as deforestation, poaching and human-induced climate change are in large part to blame for the decline. 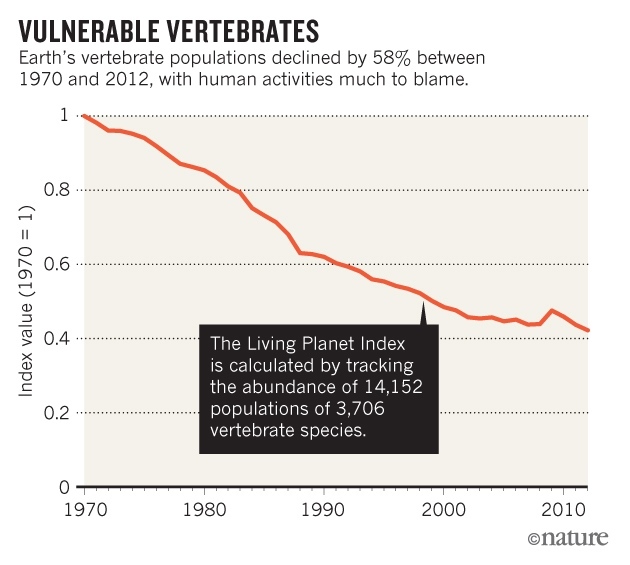 If the trend continues, then by 2020 the world will have lost two-thirds of its vertebrate biodiversity, according to the Living Planet Report 2016. “There is no sign yet that this rate will decrease,” the report says. 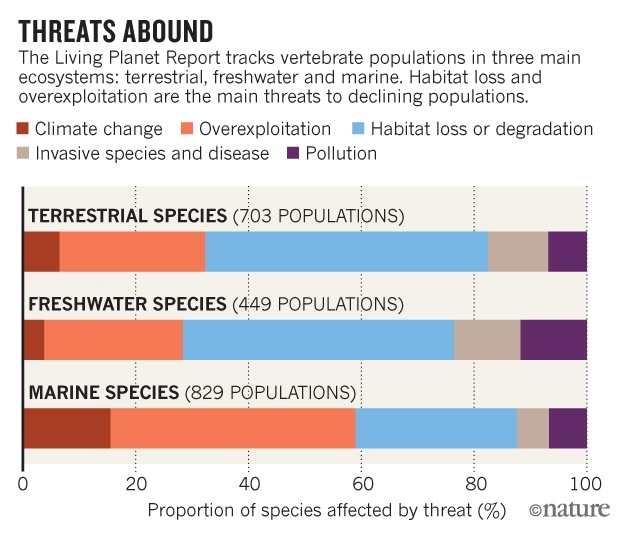 “Across land, freshwater and the oceans, human activities are forcing species populations and natural systems to the edge,” says Marco Lambertini, director-general of WWF International. The main threat facing declining populations is habitat loss—caused by logging, agriculture and the disruption of freshwater systems such as rivers. Freshwater populations, which declined by 81%, are increasingly thought to be faring worse than those living in terrestrial regions. The analysis, which is published every two years, pulls together data from more than 3,000 sources that consistently track populations, including short-term and long-term monitoring projects. It tracks the status of 14,152 populations of some 3,700 vertebrate species. But it does not claim to be comprehensive: although several hundred species (many of them fish) have been added since the 2014 edition, the data set has “major geographic gaps”, the report acknowledges, with much of its data concentrated in western Europe. Another bias of the study is that monitoring attention may be disproportionately focused on populations that are already declining, notes Hoffman. The overall pattern of decline will be hiding some population increases, he says. Still, Hoffmann says that the biases are likely to diminish as new monitoring schemes contribute data from under-sampled regions or species. Rhys Green, a conservation scientist at the University of Cambridge, UK, agrees that the data may have a bias, but says that the methods and data are substantially improved from the 2014 report. “No data set or statistical procedure can yield a perfect result, but this is the best indicator we have, and it is valuable for policymaking,” he says. This article is reproduced with permission and was first published on October 28, 2016.